Smudge resistant to keep text and images looking good. See high-contrast color with chromatic HP Vivid Photo Inks and high-definition HP printheads.1 Water- and fade-resistant prints2 last over 200 years in dark storage.3 Achieve more quality with fewer inks4 to help lower your printing costs. More quality with fewer inks4 helps lower your printing costs, and helps lower your environmental footprint. 1 RGB HP Vivid Photo Inks compatible with HP DesignJet Z9⁺ PostScript® Printer series only. 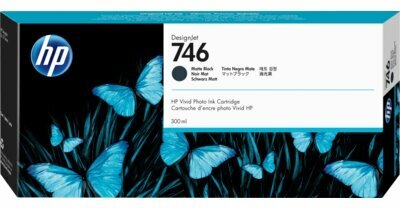 Chromatic green and chromatic blue are HP 747 DesignJet Ink Cartridges. 2 Performance may vary based on writing system differences. Print permanence estimates by HP Image Permanence Lab based on the same formulation of HP Vivid Photo Inks used with the HP DesignJet Z6200 Photo Production Printer, using 6 inks. Water resistance performance varies based on printer and print profile. Water resistance testing by HP Image Permanence Lab on a range of HP media and follows ISO 18935 method. Display permanence rating for interior displays/away from direct sunlight by HP Image Permanence Lab on a range of HP media. For more information, see http://www.HPLFMedia.com/printpermanence. 3 As of May 2017, tests conducted by Wilhelm Imaging Research, Inc. (WIR) indicate that documents printed with HP pigment-based inks printed on HP Bright White Inkjet Paper stored in the dark (assuming that the document is stored in a file folder, in a box, and is otherwise protected from possible ozone exposure and contact with water) will achieve WIR Dark Storage Permanence Ratings of “greater than 200 years.” For more information, see HPLFMedia.com/printpermanence. 4 Compared to the HP DesignJet Z3200 Photo Printer series using 12 inks.